This article will combine storytelling with analogy (or the concept of mental models in UX parlance) to approach the subject differently. Let’s start with an example. 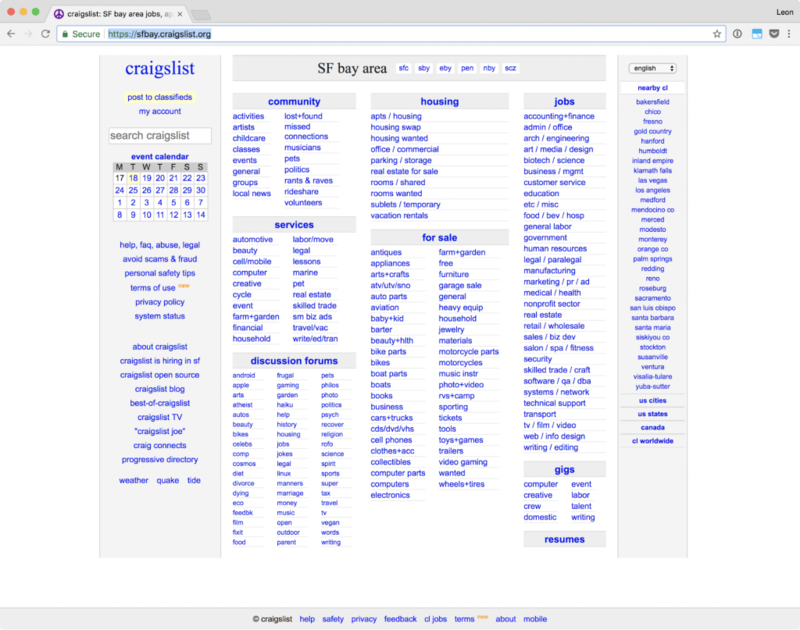 Here is a typical user interface on a website. Note: There are slightly different UI considerations for web, mobile, desktop, and other types of software, but, generally speaking, they are all software, and the following concepts apply to all of them. 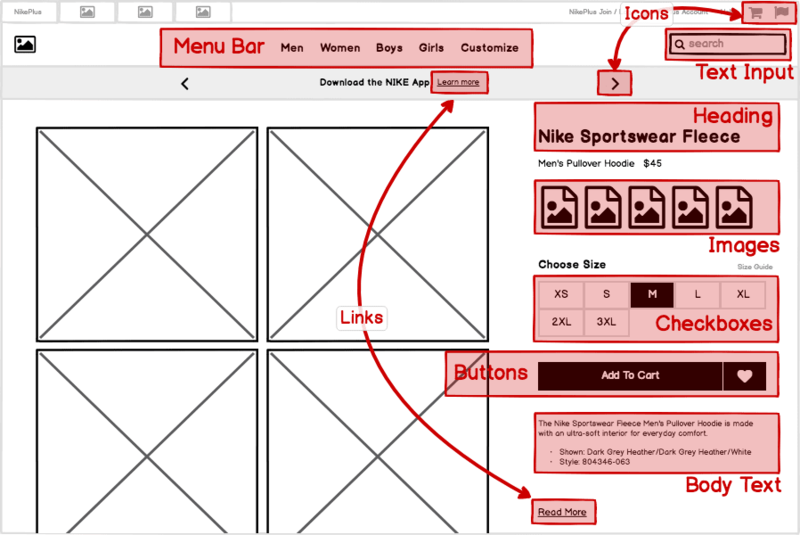 So, let’s begin by stepping into the shoes of a UI designer to see how they might approach this website UI. User interface controls are like ingredients in a recipe. Choosing the appropriate ones and using them in the right way lays a foundation for the rest of the interface. 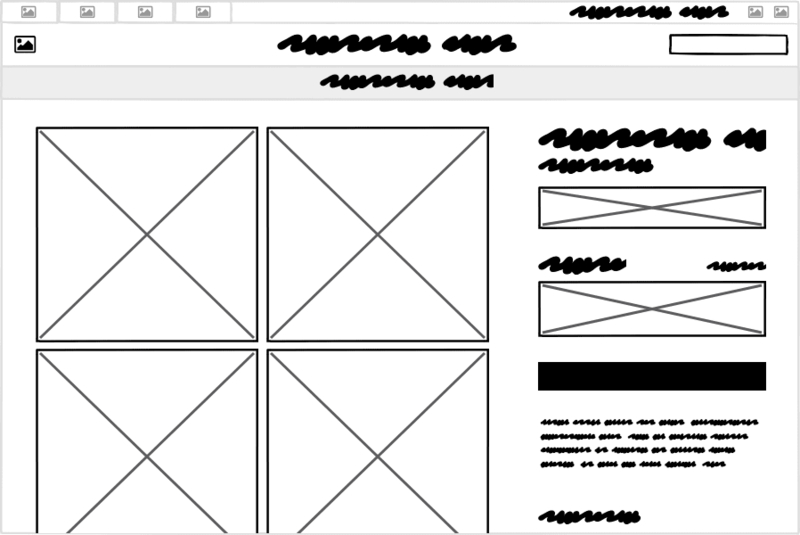 But before diving into the controls layer, let’s simplify the page above by viewing it as a wireframe. User interface controls (also known as elements, components, and widgets) are individual pieces of a user interface that perform a single function. Some examples are links, buttons, and icons. Even plain text can be considered a control, since its function is to describe or label something within the user interface. Each one of these controls was selected for a specific reason. UI design is concerned with the process and rationale of choosing controls. Returning to our analogy, even with the right ingredients/controls, things can go wrong. They can work well together, or not. This is where the process of creating patterns comes in. It can be useful to consider this layer of UI design even before moving on to the level of controls, as each pattern can meet its goals in different ways and using different controls. Aesthetics matter. And they’re not as subjective as many people think. A meal has sensory characteristics beyond the response from your tongue. What it looks, smells, and even feels like affect its taste. The most commonly understood definition of UI design is the visual design layer. But even this is more purposeful than most people understand. Visual design isn’t merely “making it look pretty.” A better way to think of it is as the application of established visual design principles, many of which are rooted in scientific psychological, neurological, or physiological understanding. Common examples of these design principles are contrast, hierarchy, proximity, and alignment. 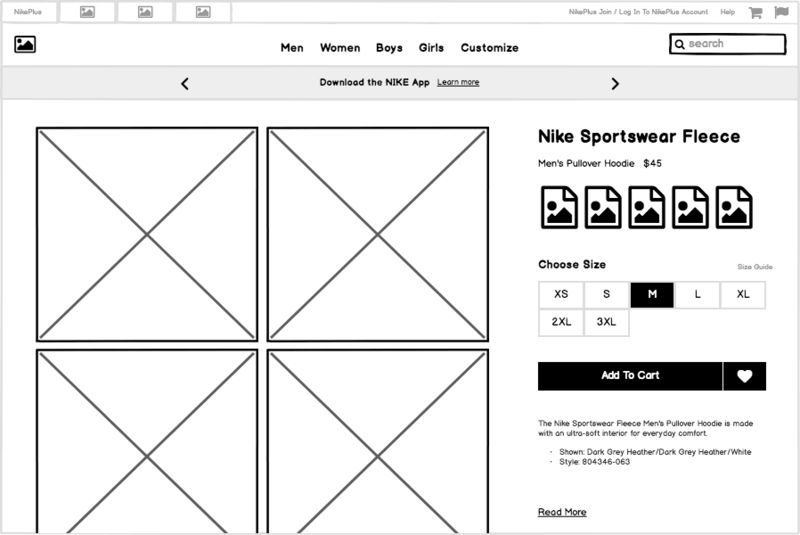 One way that UI designers evaluate design principles is using the “squint test,” which helps to further abstract the design into its visual principles. An alternative is to blur the screen. Either way, the goal is to take your attention away from the content in order to focus on the visual effects and techniques. Lastly, making dishes that are consistent and taste good together can be viewed as the difference between a cook and a chef. 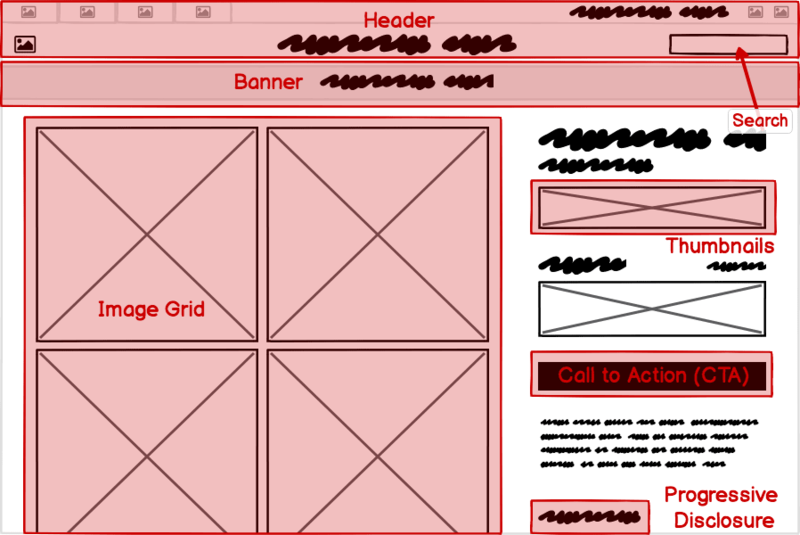 Templates are a UI designer’s secret weapon. 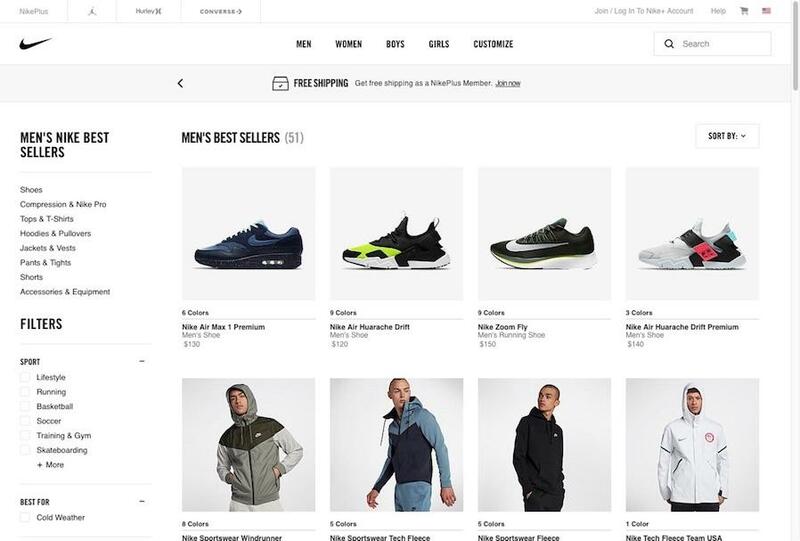 Looking at our example site as a whole, we can view this page as an instance of a template that can be reused across the site, rather than a single page that was designed for this particular article of clothing. 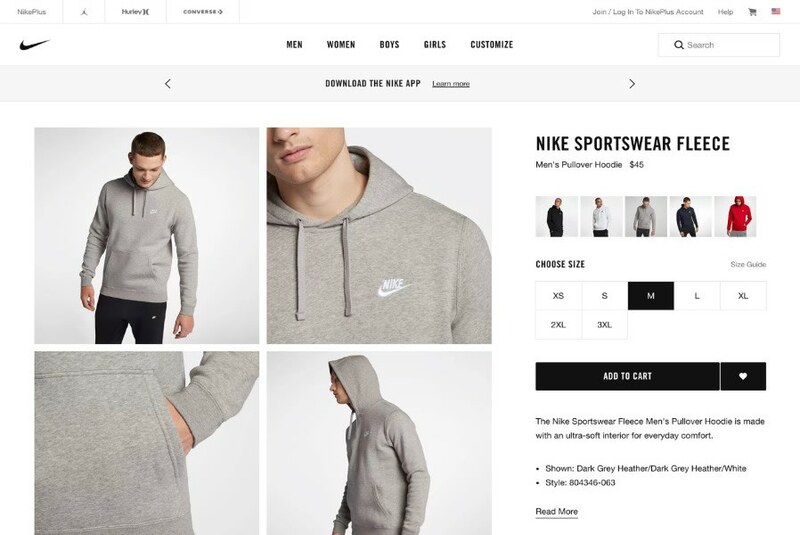 For a site or product that can have dozens, or even thousands, of screens, it is useful both from the designer/developer and the end-user perspectives to have screens that behave predictably and look similar across the entire application. The example we’ve been examining could be described as a “product detail view” template that would look very similar when any other product is viewed. Other templates for this site might include one for checking out and purchasing, and another for displaying search results. While every product may use different types of templates, all software types can benefit from a template-based approach to design. So What the Heck Is UX, Then? Now let’s talk about the areas of UX that aren’t UI design. That is, what are the parts of a user’s experience that aren’t impacted by the areas described above? Instead of looking at all of the areas that aren’t UI, like in the Venn diagrams, let’s dive into a few of them deeply for a different perspective, again using our culinary analogy. Earlier, we talked about a few things that make a restaurant good or bad aside from the food. In the same way, a user can have a good or bad experience with your product, separate from the quality of the interface. You can probably understand why I skipped it. It’s in a building with a smog check station on one side and a car muffler store on the other. I believe that the expectations set by the restaurant’s appearance affect people’s perception of the food. They expect a quick, inexpensive meal, but maybe don’t have high hopes for the food itself given what it looks like from the outside. The fact that the food is very good is what is called a delighter—something that goes beyond expectations (given the context; the same food might only meet expectations elsewhere). The design is very utilitarian. It’s not pretty. 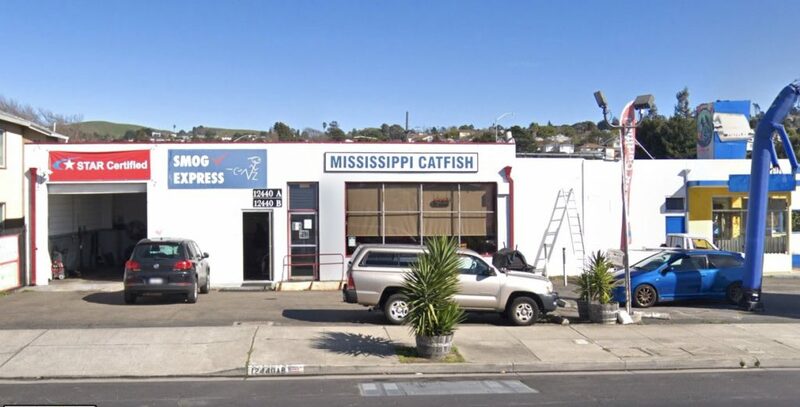 It sets the expectation that it exists to serve a simple purpose, but, like the catfish restaurant, you could be forgiven for expecting a poor result from it. And yet, for decades people have been pleasantly surprised (delighted, even) by the usefulness of Craigslist and its ability to connect them to just what they were looking for. That delight is, in part, due to its functional appearance. The lesson here is not that ugly design is good, but that people’s expectations are shaped by events that occur before they even touch a user interface. Part of UX is to design the pre-use experience with this in mind. What does this have to do with UX? Well, have you seen something like this before? Sites like YouTube and Facebook use skeleton, or placeholder, screens to show you something almost immediately. These are the bread and butter that the waiter/waitress gives you. By providing a hint, a preview, of what is coming, you begin the experience earlier and the wait time doesn’t feel as long. This is really just a novel variation of the perennial loading indicator, which has long been used to tell the user that, yes, something is happening. So, UX is also concerned with the transitions between experiences. A user interface is mostly a static object. It may have dynamic elements, but, generally speaking, a software product consists of a series of user interface screens connected together. 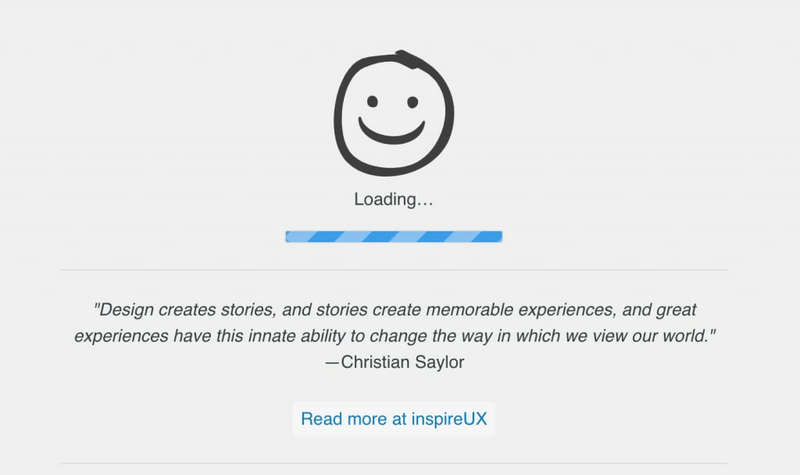 A user’s experience, however, is very dynamic and can’t be captured in a moment in time. Just like a customer’s restaurant experience begins when they walk in the door (or even before, as we saw above) and ends when they leave. It is how they are greeted, what the interior looks like, how much the food costs, the friendliness of the waitstaff, the music, the lighting, and their own individual mood and expectations. And each of those factors has an impact as they occur over the duration of the experience. 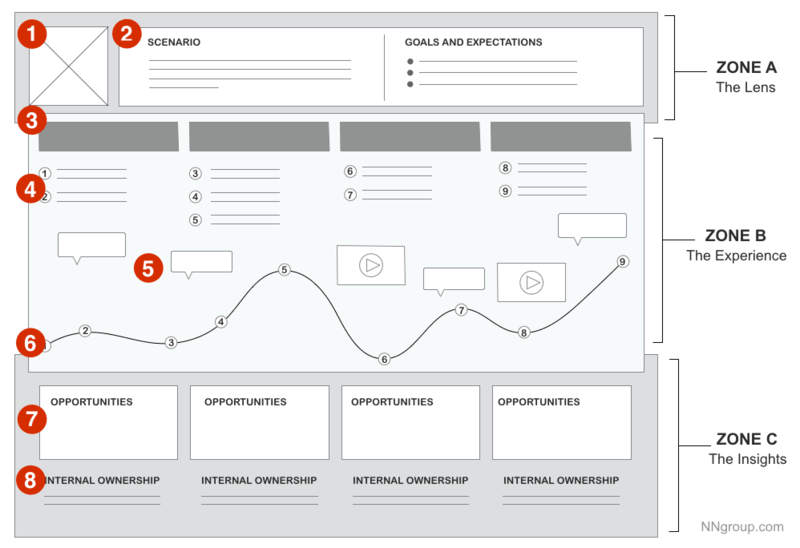 Journey maps and similar tools suggest that the process, the flow and the feeling, can also be designed. So, UX is concerned with the “touch points” along the experience. Finally, a UX designer has to think about whether the product addresses the user’s goals. Simply put, does the thing actually do what I want it to do, or is it the right solution to the wrong problem? If I really want a hamburger and all you serve is chicken, I’m going to leave disappointed, regardless of how tasty the chicken is or how pleasant the ambiance is. In the end, UX is about user advocacy. A UX designer should know what users want and don’t want. One of the great things about the field of user experience is that it is so many things. It attracts people from all educational backgrounds and life experiences. You can be a terrible artist and still be a great UX designer. You can be an engineer or a writer or a psychologist and be a UX designer. Moreover, you don’t actually have to be a UX designer to do UX design. A good CEO is constantly thinking about the experience their customers have, from the first point of contact to the last. And at the highest level of UX maturity, UX is woven into the fabric of a company, such that essentially everyone contributes to it. But if that makes the question of the difference between UX and UI too complicated, just think of UI as the food and UX as the restaurant. It’s close enough. Want to learn more? 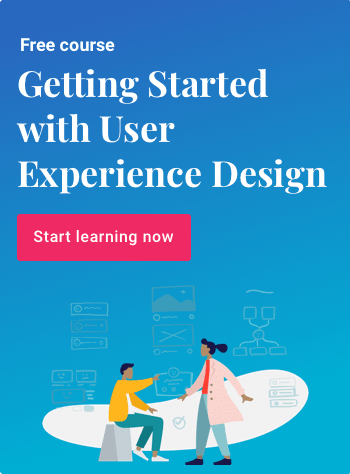 Springboard’s UX Career Track is a self-paced, mentor-guided bootcamp that will help you land your dream job in user experience. Find out more today. Leon is a designer and writer for Balsamiq and a Springboard mentor. Follow him on Twitter @leonbarnard.